• Wood used today is not old growth wood. • The wood is spiced together by “finger joint” techniques. • The preservatives used to treat the wood are not as toxic. •The paints are not as toxic to microbial life . •The manufacturing techniques are sloppy. Let’s discuss the above points. Wood used today is not old growth wood. Trees used today to make windows are typically planted and harvested in a short period of time in, for lack of a better term: tree farms. Trees are grown in these farms and spaced so that they will grow at maximum speed. As a result of growing so quickly, the tree is not as dense and hard as those trees that have a chance to mature and age. The wood is spiced together by “finger joint” techniques. Competitive pressures in today’s market place have forced the lumber mills to optimize the yield of the trees that are grown. One of the techniques they use to achieve high utilization of the tree is a technique called “finger joint” splicing. See Figure 1 for a view of the end result of this process. 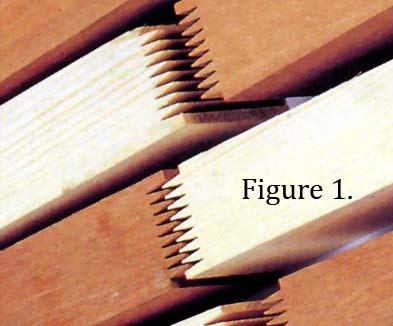 Using this process, the wood mills will splice the wood and glue it together. The result is a piece of lumber that is pleasing to the eye. The problem is that the spicing effectively exposes more end grain of the wood. If moisture gets to this end grain, the wood will soak up moisture like a sponge. If this happens, the wood swells and puts pressure on the paint to the point at which the paint can rupture. When this happens it is only a matter of time to see evidence of rot and decay. The preservatives used to treat the wood are not as toxic. EPA regulations have made the preservatives used to prevent wood from rotting much less effective. The toxins used in the past to preserve wood were toxic to microbial life that exists in nature to decay wood. The problem is that these preservatives were also toxic to humans. As the EPA has regulated these chemicals out of the paints and preservatives, there has been an accelerated rate of rot in modern day wood windows. The paints are not as toxic to microbial life. Paints have been improved in many ways to be more durable, but in the process of the development of today’s high performance paints, they have been subject to many EPA concerns. As a result, paints do not, in many instances deter microbial life like they once did. Lead has been removed for the betterment of society, but one of the consequences to that wood rots more quickly and has to be painted more often. The windows are not painted until a few weeks or days after installation. Unfortunately in today’s fast paced building techniques, many builders will wait until the later stages of the construction process to paint the windows that were installed in the home. If the weather resulted in rain on the unpainted windows, then it is a fact that the windows will have absorbed moisture. And this moisture will cause the paint to not adhere correctly and can cause the paint to rupture later as a result of the pressure that the moisture can create under the paint. This will result in blistering and more wood exposure to the elements, hence further rot and decay. The manufacturing techniques are sloppy. Note from a guy who has been in the window business for over 25 years. When I got into the business circa 1985 our company got into this new window system that was made up of uPVC (a.k.a, “plastic”, “vinyl”, and other disparaging terms). Being a product of my environment, I, too, was a skeptic. I thought wood windows were the cat’s meow. I’ll admit it, I had a preference for wood at the time. I, however, had a big advantage over the average person. We had a small business in 1985 and we had to wear many hats, one of which was service technician. I went on almost every service call back then and I started getting an awakening to what materials really made good sense in the fenestration arena. Over a couple of years I finally realized that wood is not a good material for windows in the 20th and 21st century. As a case in point, I would like to refer the reader to a job we did in 1985. It was my uncle’s house in Kennett, Mo. Uncle Omer built a new house in which he is still living in 2011. The windows are an absolute marvel. The literally look brand new. After 25 years they are spotless. If you really want to buy a wood window, then please read my article: design considerations for wood windows. There’s also the matter of those in the construction industry who think that flashing is a bunch of college kids running around naked. Very true Don. Flashing is one of the most important things in the installation of windows and doors and is often not done–specially twenty years ago. If the window or door is not flashed correctly and water finds a way behind the brick pocket, it will find a way inside the wall if possible and that is typically through an unflashed window or door.